I have the Kobo (Canadian version) and for me it was a similar feeling of joy, but for a different reason. I've had such bad eyesight for such a long time. Not bad enough to interfere with day to day living, but impossible to read the print in books. The Ereader allows me to change the size of the font mid sentence if I need to. This has opened up the worlds of books to me again. And I am so happy! I'm still not sold on the e-reader - but I am open to being convinced! great post. I have similar feelings (though not to the point of tears of joy - that's lovely!). I love that you can get access to obscure, out of print books too as well as books that are only available in digital format. I still read paper books, but I love the additional options the Kindle gives. When tech writer Andy Ihnatko reviewed the newest Kindle, he said: "if you love books, you won’t ever be happy with a Kindle or any other e-book device. But if you love reading, it’ll bring your love to a whole higher level." 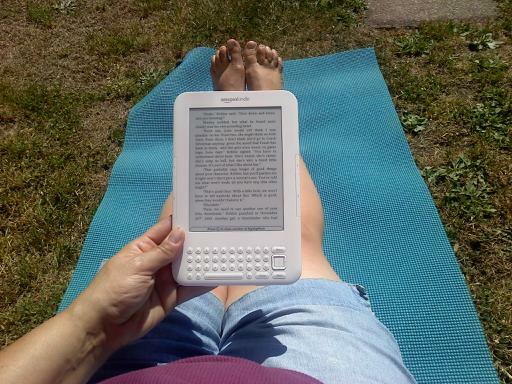 That's how I look at my Kindle :) It won't replace my physical library-- it enhances it. What a great advertisement for the Kindle. I'm the other way round, I love a heavy hardback to read! Funny, I almost ordered The Dome from the library at the weekend, but ended up choosing The Magic Cottage instead. I'll give The Talisman a try. I am also an avid reader, and feel very much the same way as you about books, the adventures they take you on and the recollections of reading them. I have mixed feelings about my Kindle. On one hand it is very convenient, particularly for travel and research on the go. On the other hand, the idea of not being able to buy "used" books is a big deal for me (or share, or give to a friend). And also the public library, which I frequent all the time -- where can I "check out" e-books? My dad just gave me a box of his books from his graduate school days in the UK during the 1950s, including a signed C. S. Lewis. I think sometimes now, "What will I give my son?".. A 10 year old Kindle with a dead battery? These things really have no long-term value, certainly not as an investment, and most likely not as an heirloom. Also, nobody has made an open-and-shut case yet for the environmental savings of e-books, the toxic materials (PVC, mercury, etc.) that go into making these electronic devices are in some cases worse than printing and paper-making. They end up in landfills in developing countries. Moreover, the server farms that house the e-books books have huge electricity requirements, and it seems strange to me to have to turn on an electronic device (and charge it) just to read a "book" in broad daylight. So yea, I have one foot in the door, but am a bit concerned about moving all the way to digital in terms of reading. Jackie, yes, yes.. very inspired! Thank you! Liz - I so hear you about eyesight! I need bi-focals but am in denial. The Kindle is easy to read and I love that you can change the font settings. Megan, I didn't even want to CONSIDER one because I thought it was blasphemy. When you see someone with one, ask them to take a peek. Sophie - I did NOT know about exporting my annotations! That's awesome! Thank you for the tip! Woot! I also hear you 100% on the environmental issues connected to electronic devices. Technology moves so quickly that we often become convinced that we "need" a certain device in order to survive without taking the time to examine the impact said item has on the world as a whole. I genuinely appreciate your taking the time to read my post and respond with such thoughtful comments. Thank you! That is exactly how my first experience was when I got my Kindle. What a lovely story about a change of heart. 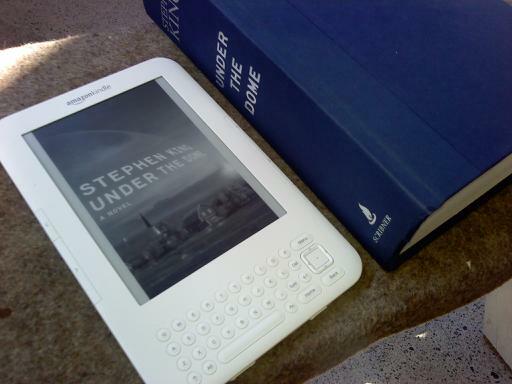 I totally understand your trepidation and the joy of discovering what a wonderful device an ereader is. Will I miss a stack of dusty books at the used bookstore? Yes. Will I miss dusting them off at home? Not so much. For me, the book I am most looking forward to reading on my Nook is Neal Stephenson's The Diamond Age which is about a poor young girl who gets a virtual book that opens up the world of learning and education to her. It seems like the perfect story for an ereader.